You’ll want to unwrap this stunning gift soap as soon as you see it. 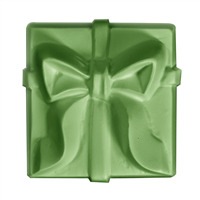 Adorned with a ribbon and a fun stamped pattern, the Gift Box Soap Mold is perfect for Christmas, holidays, and birthdays. Bar Depth: 1.5" Bar Length: 3.75"
COMMENTS: This makes the perfect surprise! Gift someone a bar of soap and lotion & they will forever remember it. COMMENTS: Great for Christmas or Birthday Soaps. 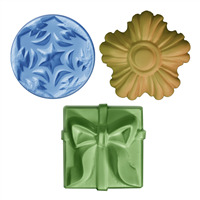 "meaning of "gift box 2 soap mold" in 1 pack 2 pcs or not? " Staff Answer It is one mold that makes (3) 4.75 ounce bars that look like gift boxes (as pictured).